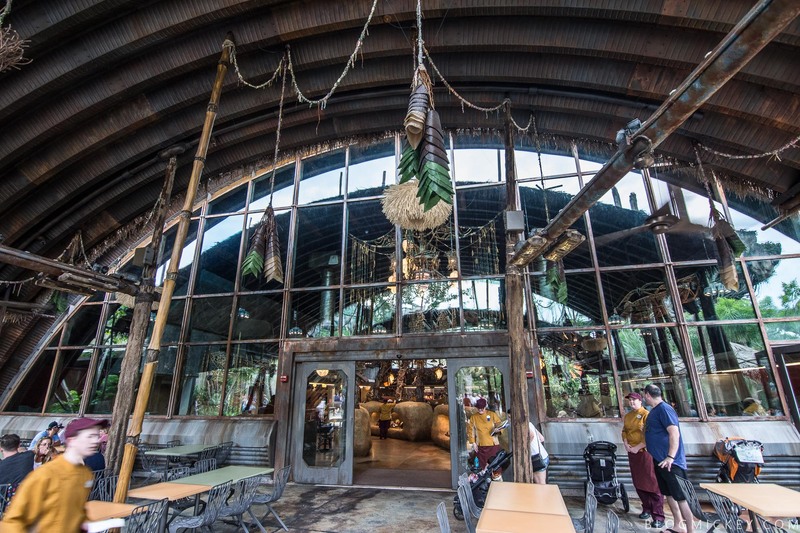 We continue our Pandora – The World of Avatar sneak peek this morning with a look at the restaurant inside Pandora, Satu’li Canteen. 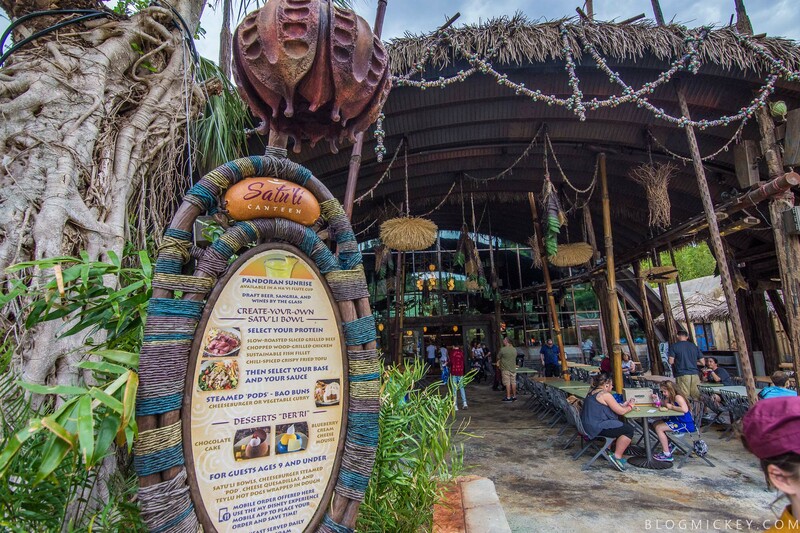 The Satu’li Canteen was once the main mess hall of a large RDA base located in the Valley of Mo’ara, but now the canteen is owned and operated by the ACE tour company. A restaurateur hired by ACE has redesigned the once utilitarian Quonset hut structure into a beautiful museum-like dining room. 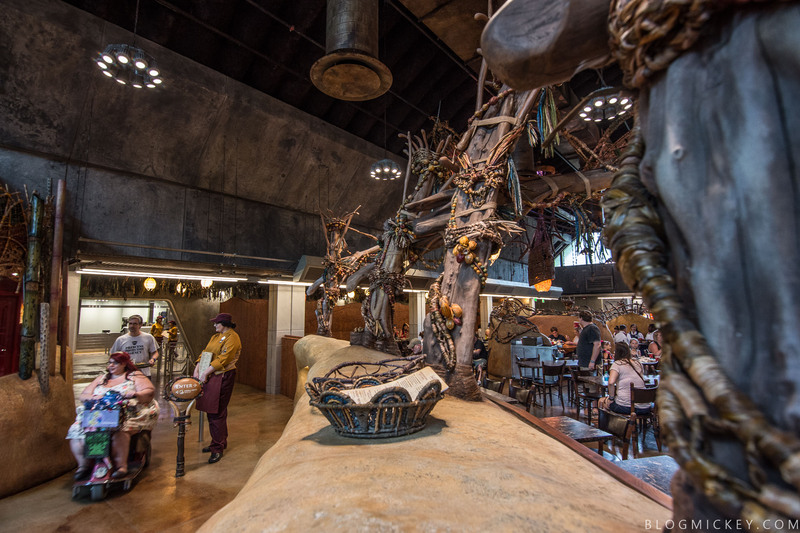 Featuring Na’vi art and cultural items, the Satu’li Canteen now reflects a new friendship and cultural understanding that exists between the humans on Pandora and the indigenous Na’vi. 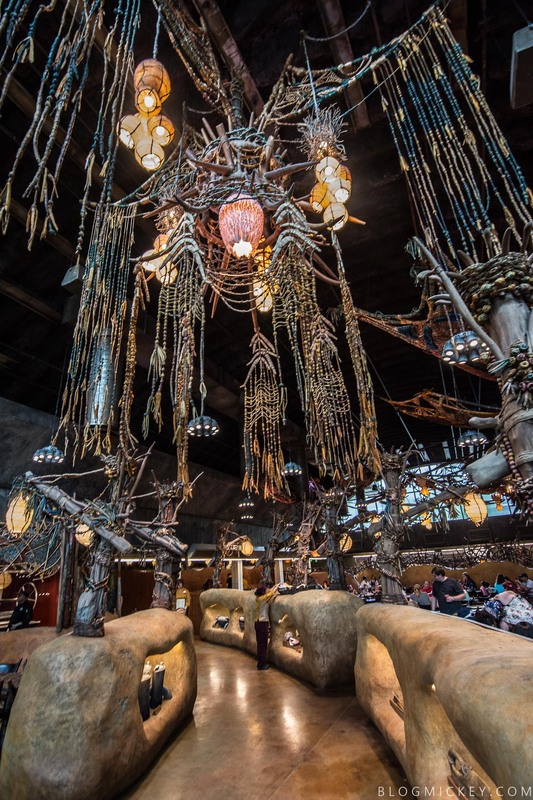 The interior has been transformed, with the colorful Na’vi items filling the walls and hanging from the ceiling. Most of the items were gifted to humans by the Omaticaya clan living in Mo’ara. 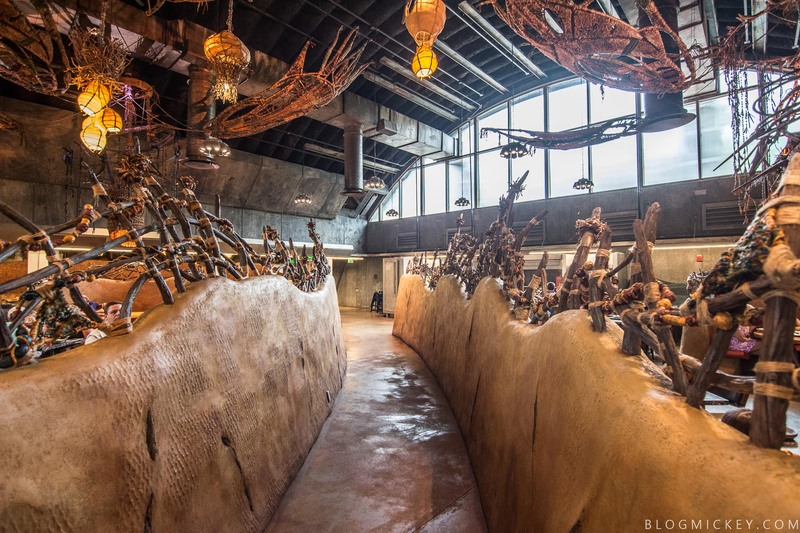 Hand woven tapestries, natural Pandoran elements, and even cooking tools can all be found inside the restaurant along with sketches and photographs on the walls that help explain their significance. 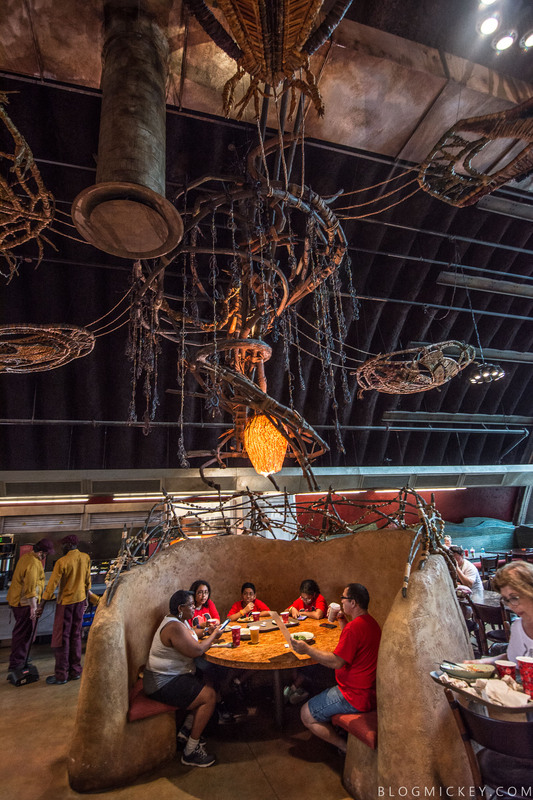 With this unique display of cultural items, the Satu’li Canteen visually represents the positive influence the Na’vi have had on the humans living and working on Pandora. 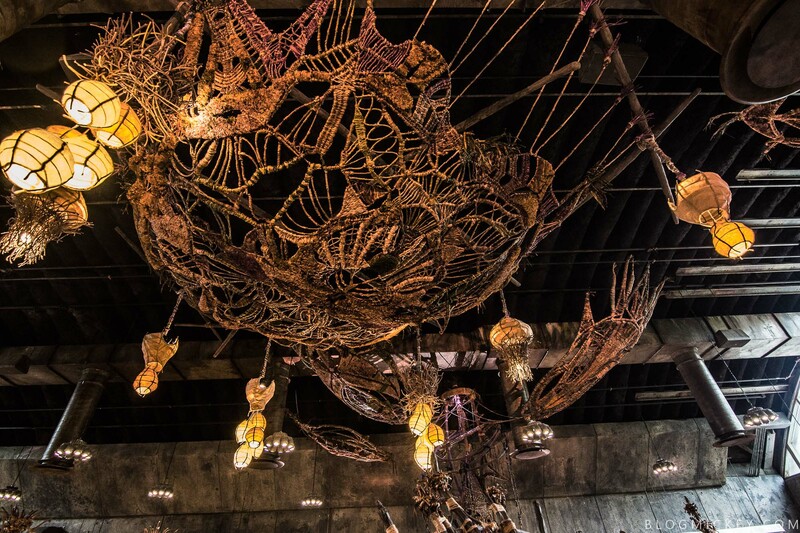 The open ceiling draws the eyes upwards towards the hand-woven art pieces. 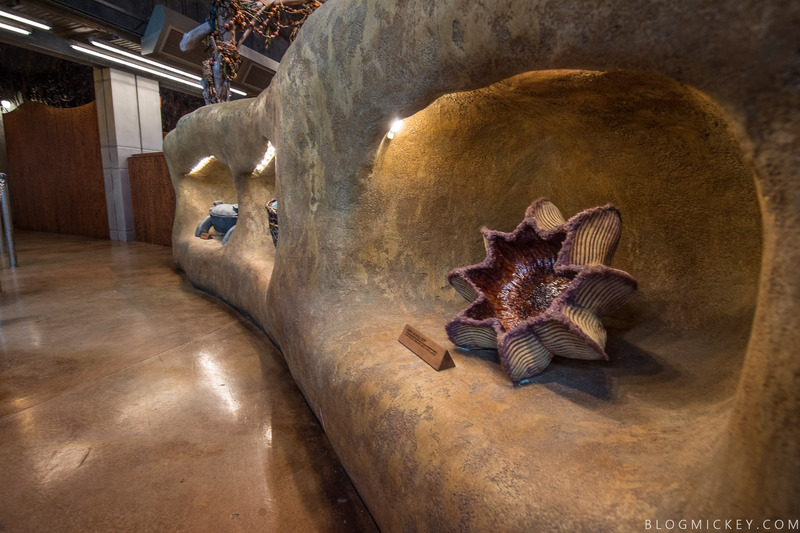 The contrast of the old RDA facility ceiling with the soft art of the Na’vi provides an excellent commentary on the conflict, and eventual peace, that led to a place like the Mo’ara Valley. 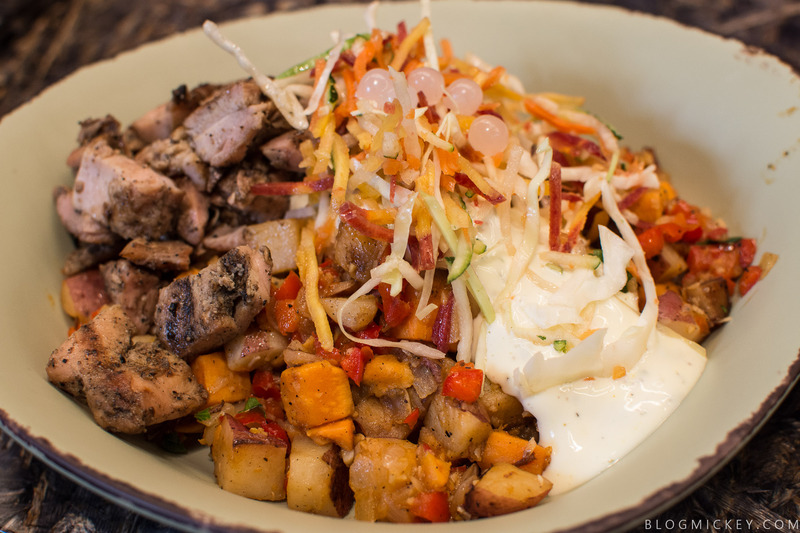 Satu’li Canteen features four different create-your-own Satu’li Bowl in addition to some other offerings. The way the create-your-own bowls work is that you start with a protein, choose a base, and then finish it with your choice of sauce. Because we’ve had a limited amount of time, we didn’t try all of the different combinations, but we did play around with our options and we’ll note it below. 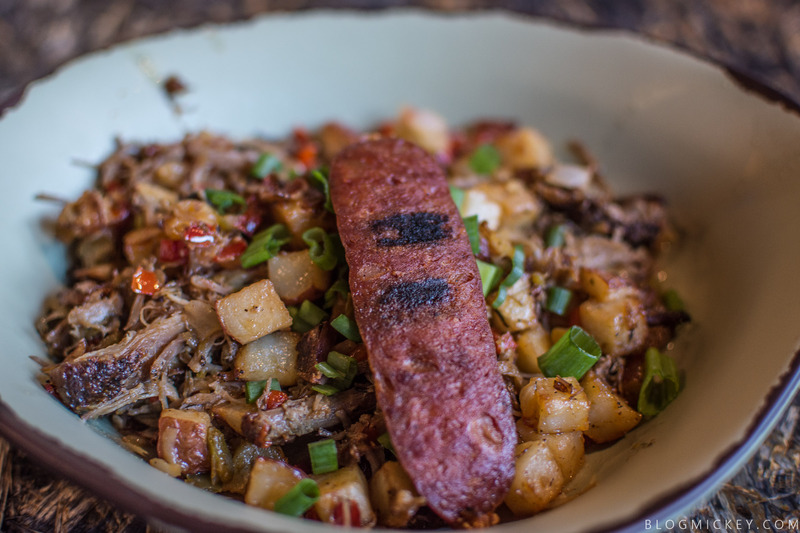 We paired this with a mixed whole grain and rice base and the charred onion chimichurri. 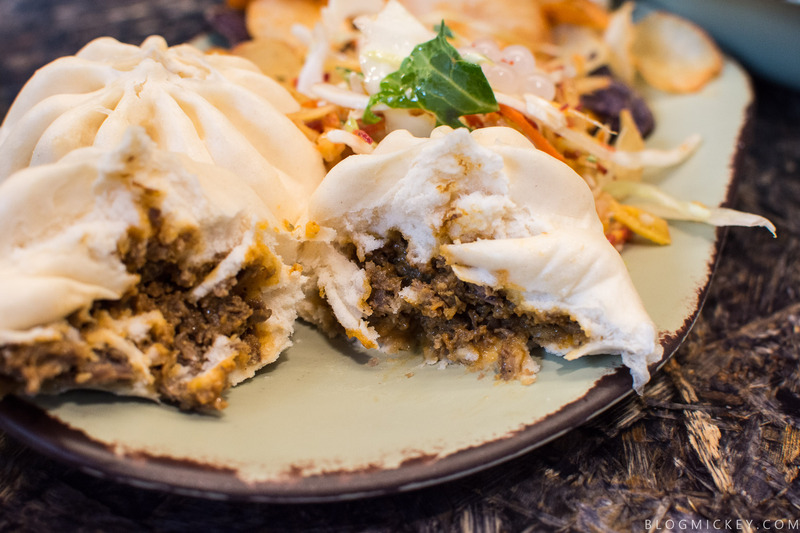 Slow-Roasted Sliced Grilled Beef marinated in a blend of Garlic, Herbs, Red Pepper Spice, and Red Wine Vinegar topped with Crunchy Vegetable Slaw and Boba Balls. It’s rare to see a meat of this quality come out of a Disney quick service. The beef was sliced into long, thin portions and was some of the most tender I’ve ever had on property. The texture reminded me of a roast beef and the slow-roasted flavor was delicious. The whole grain rice wasn’t my favorite base, but I did enjoy the chimichurri. We paired this with a red and sweet potato hash base and the creamy herb dressing. Wood-Grilled Chicken Thighs marinated with Garlic and Olive Oil topped with Crunchy Vegetable Slaw and Boba Balls. This was probably my favorite create-your-own bowl that we had. The chicken was cooked perfectly. The marinade was nice and light and didn’t overpower the wood-grilled flavor of the chicken. 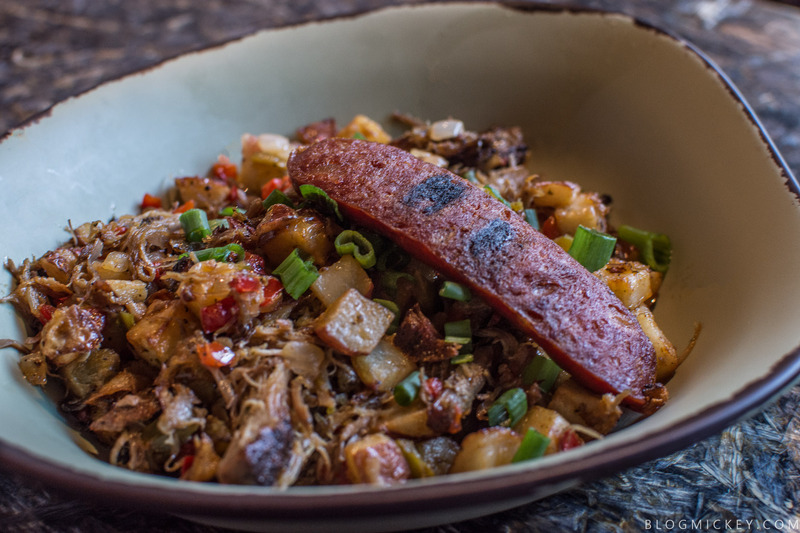 The base we chose was my favorite of the day, the red and sweet potato hash. The combination of that with the creamy herb dressing is, in my opinion, the “go-to” base for those seeking flavor. My advice would be to order some dressing on the side for when you inevitably want more. Excellent dish through and through. 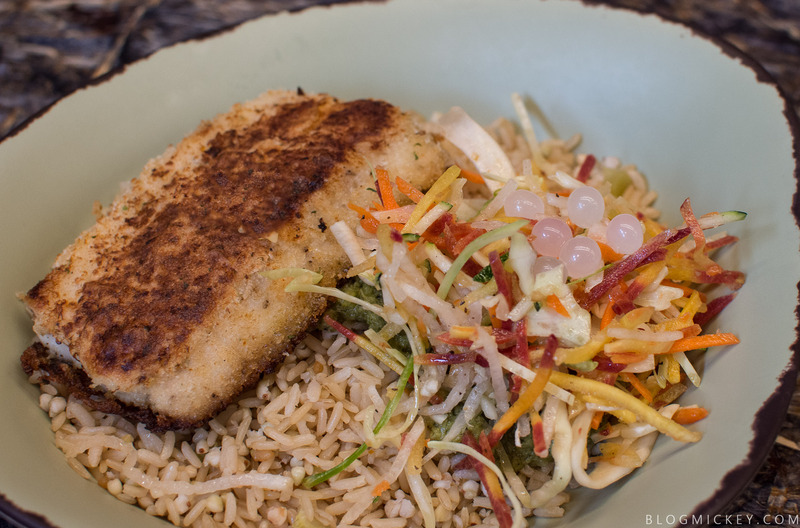 Panko Breaded Mahi-Mahi topped with Crunchy Vegetable Slaw and Boba Balls. We paired this with the mixed whole grain rice base and charred onion chimichurri. While I personally didn’t get a bite of this dish, others at our table reported that the mahi-mahi was a solid choice. It was crunchy on the outside and flaky on the inside with a hint of sweetness. Steamed Cheeseburger Pod stuffed with Ground Beef, Ketchup, Mustard, Pickle, and Cheddar Cheese served with Crunchy Vegetable Slaw and Vegetable Chips. If my interest in the create-your-own bowls was high, my interest in the cheeseburger pods was through the roof. I had heard a bunch of different descriptions from Cast Member taste tests and was ready to give it a try when we had our turn. The flavor was spot on to what you would expect from a typical cheeseburger. These are probably 5-8 bites each and feature quite a bit of bun. I think the real winner on this dish is the meat inside and would love for more of it to find its way into each pod. The chips were also quite good and were so fresh we thought Disney had baked them in-house. 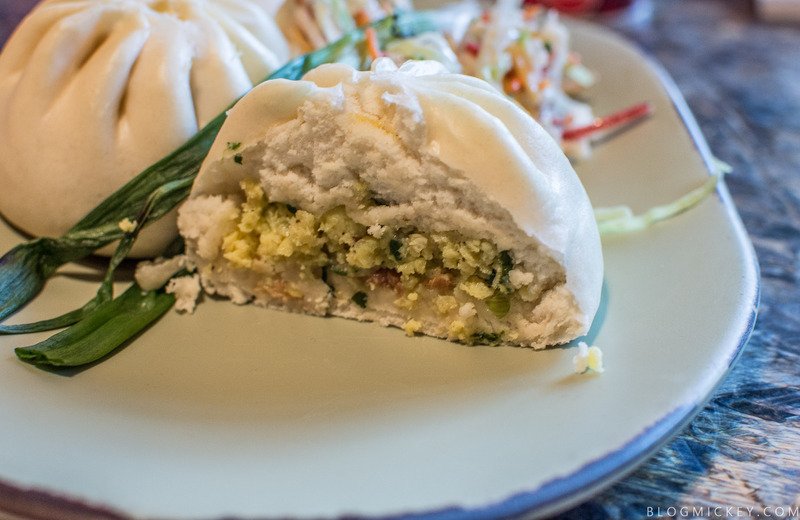 Satu’li Canteen will be open for those adventurers exploring Pandora who might want breakfast. As impressive as lunch is, I think I’ll find myself having a breakfast more often than not. Lets dive in. Served with wood-fired herb-crusted beef and chimichurri. This dish was quite good. The frittata packed a lot of vegetables in, but was still nice and light overall. The beef was tender and prepared in a similar fashion to the lunch offering. 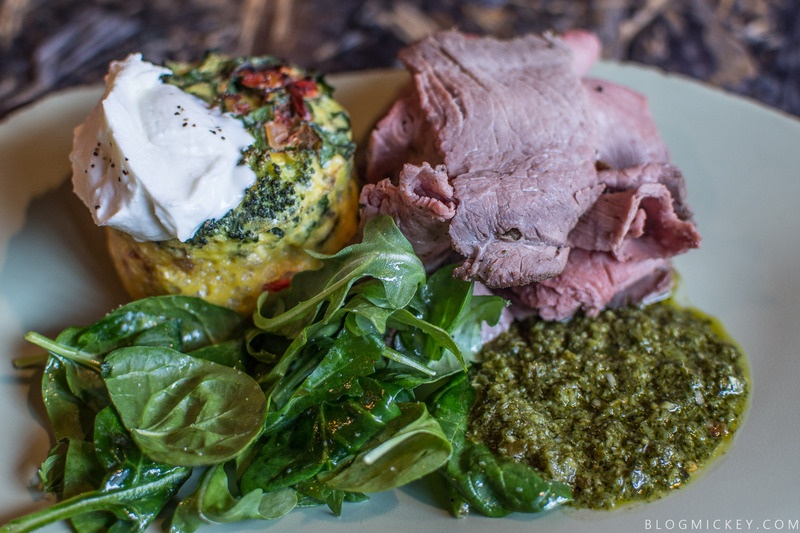 The chimichurri paired nicely with both the beef and frittata. Just like the chicken and hash was the winner for me during lunch, this plate is the one that will keep me coming back at breakfast. Packing a bit of some heat, the dish reminded me of a classic take on southern food back on Earth. The chorizo sausage added more flavor (and some heat) to a dish already packed with a variety of flavors in every bite. The most important part of the meal was that the slow-roasted pork shoulder didn’t come back dry, and I’m very happy to report that it was as soft and tender as you’d hope. This plate seemed to underwhelm those who ordered it in our party. 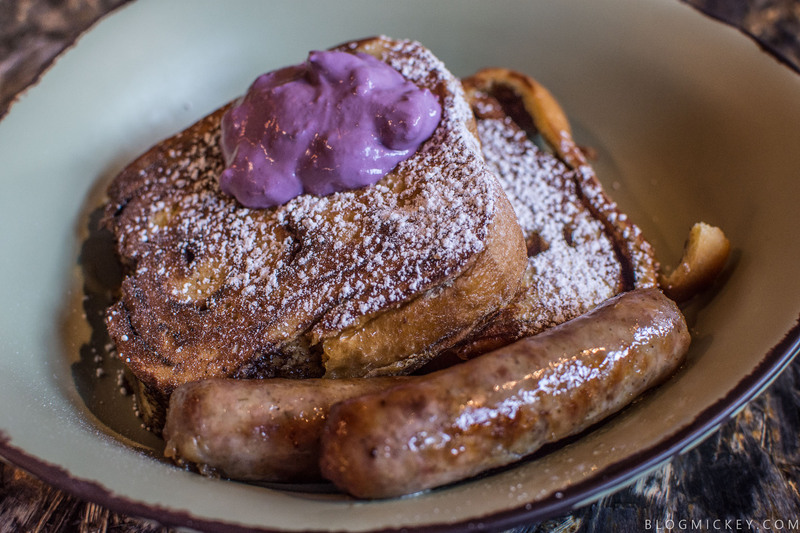 While they said the blueberry cheesecake dollop was ok, they preferred the syrup that is provided at a condiments bar. 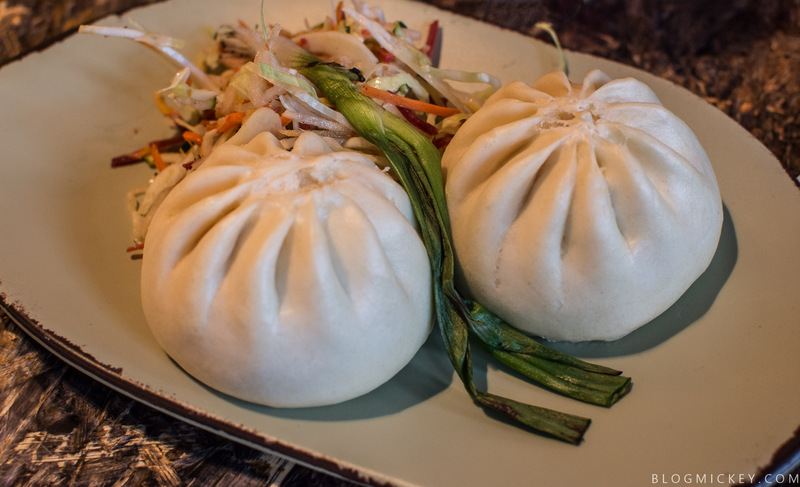 Another take on the “pods” style of food, these also came with a bit more bun than we would have liked. The word that came out of this dish from our table was “standard”. If you’re going to get a “pods” style dish, I would stick with the cheeseburger pods at lunch. 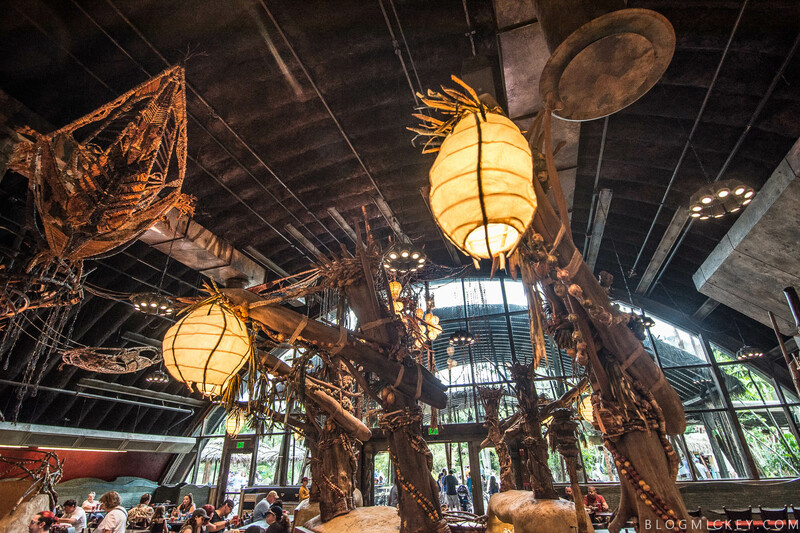 No trip to Pandora would be complete without some dessert. Let’s see what’s on offer. We really enjoyed this dish. 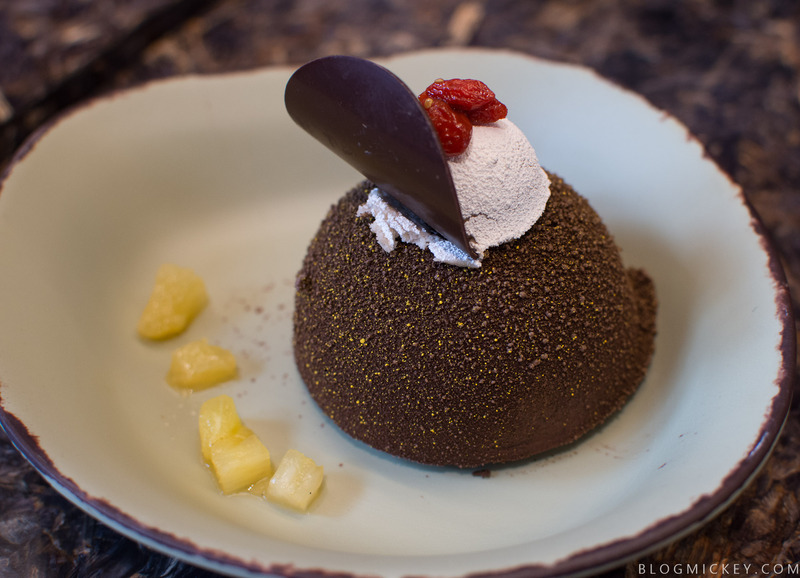 Perhaps the most “alien” looking of the offerings at Satu’li Canteen, we found that the dessert was actually quite familiar. It more gelatinous than mousse on the texture scale. 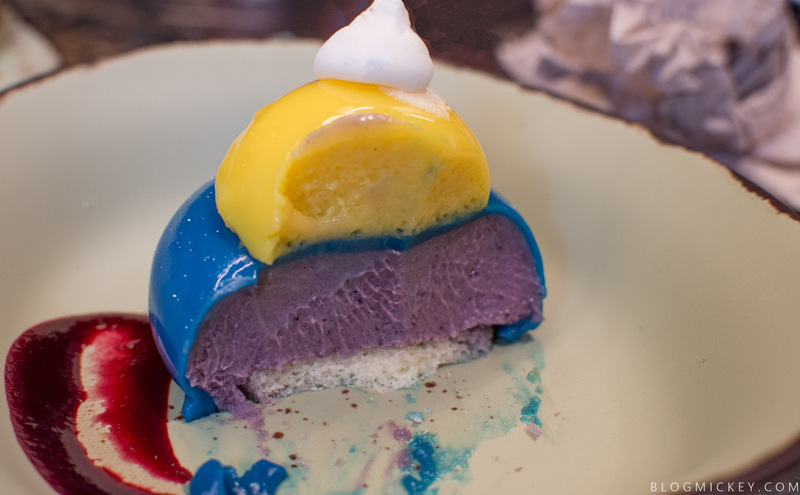 The balance between the passion fruit curd top and the blueberry base is excellent. 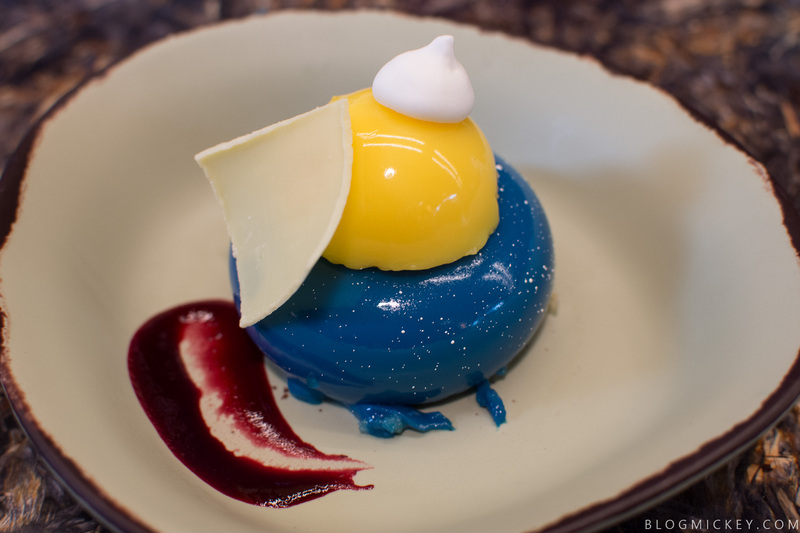 The passion fruit curd is similar to the calamansi mousse at Tiffins, for those of you who have dined there. If you like rich chocolate, this is for you. Classically chocolate through and through, there is a bit of deviation in flavor once you reach the banana cream topper. It sits on a crunchy cookie layer. 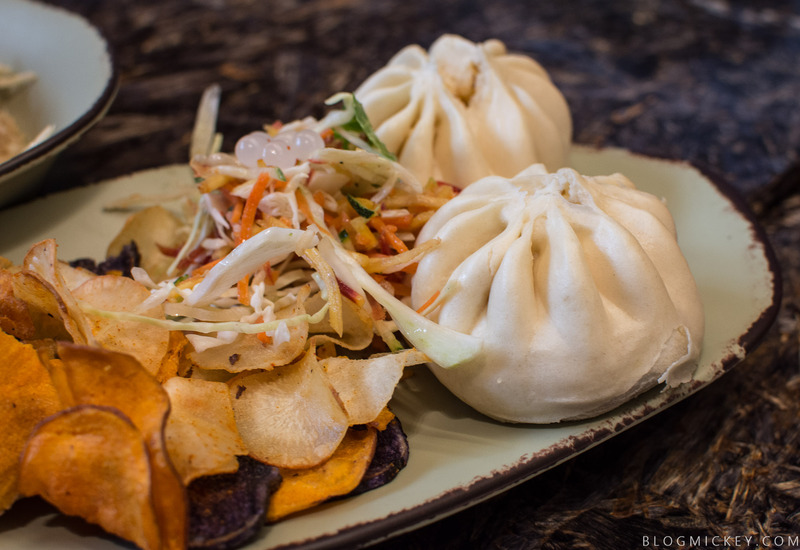 For us, Satu’li Canteen is a home run. Good tasting, healthy dishes combined with customization options allow you to be as adventurous or tame as you’d like. The high quality of food here would fit in with many table service options. We hope that the kitchen can keep the excellent work up when Pandora opens to the general public. When Pandora opens on May 27th, you’ll also have the option to use Mobile Order. 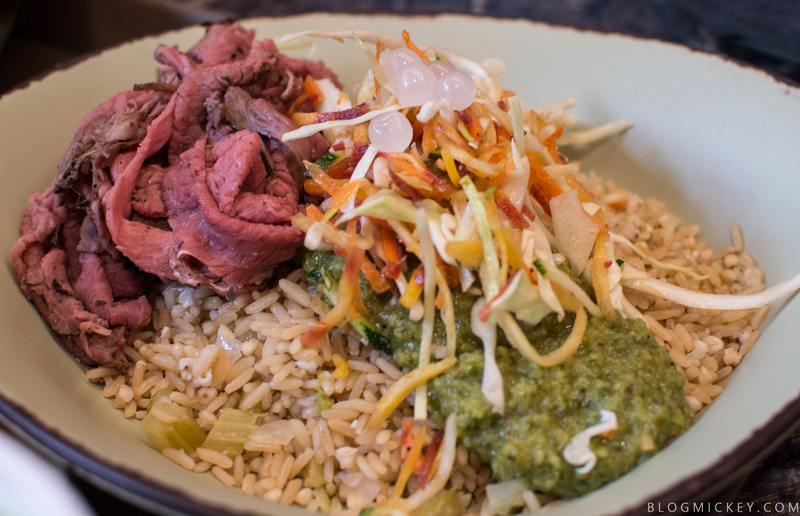 When you make your trek to Pandora, we’re happy to say you have an excellent dining choice in Satu’li Canteen. Great review guys and I could not agree more. We ate there on Wednesday during the 6-8 AP preview time slot. I ordered the chicken with wild rice and creamy herb sauce bowl and it was really good. I love how it comes in an actual bowl with silverware. And of course the theming is top notch all around. I would almost place this with dining at BoG in NFL. 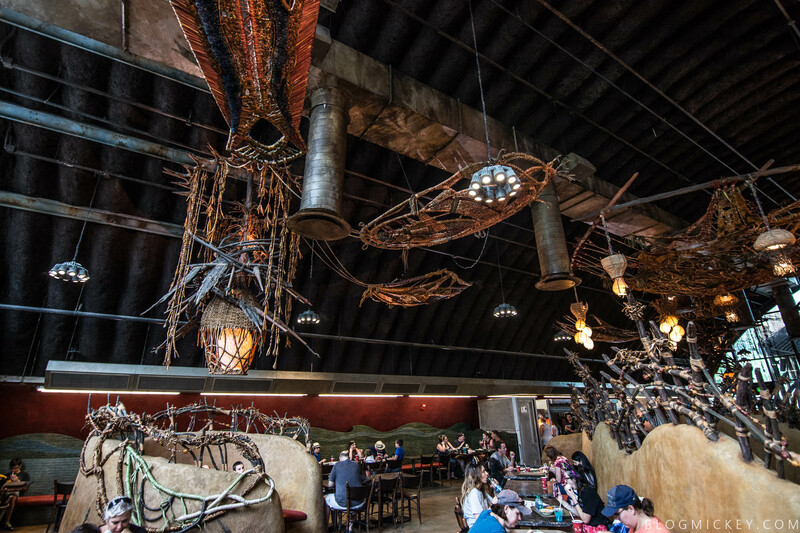 The only difference being of course that BoG might be one of the most impressively themed QS lunches I have had (and of course they bring the food to you on glass covered carts!). But the food was a surprising home run for me.